A Saturday morning in June 1987 at Worthing, West Sussex. ERF/Jennings/SS85 HP MPX 842J, (New To Horsham in all yellow livery moving to Worthing in 1981), Range Rover Carmichael Commando Rescue Tender of 1976 KBP 550P (having been repainted from Dayglo red, and before receiving yellow reflective strips), and in rear drill yard, Ford Contact BA Control Unit CPO 635L(delivered in 1973 in Yellow livery), which shared the second bay with the RT. Just visible is the rear of 1st pump Dennis RS B417 UBP. Added by Oliver Todd on 05 June 2018. The cab was Coventry Yellow as well when new to Horsham, as West Sussex used Coventry Yellow as a high visibility colour between 1969 & 1971. (and till 1974 for 2nd line vehicles such as the 3 Ford BACVs and 2 Maintenance vans). The cabs of all 3 West Sussex ERF HPs were re- painted red in the later 1970s, but the booms sensibly left yellow - weird in that the 3 West Sussex ERF HPs were the only ones in a Yellow/Red combination, but very effective and eye catching. 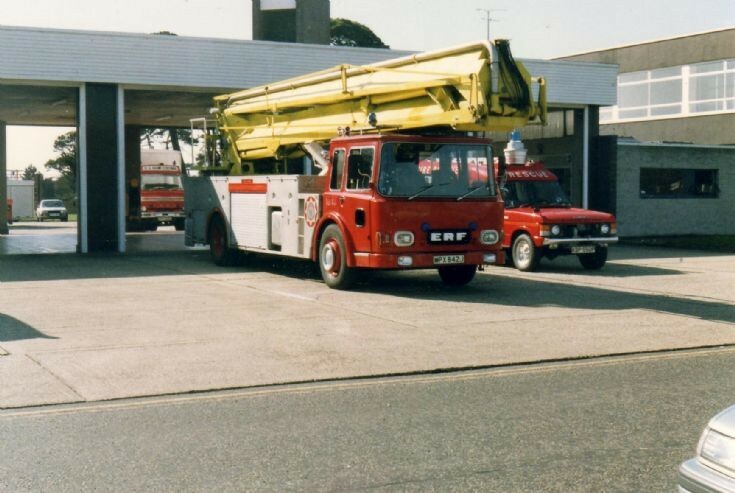 This was the only one of the 3 to escape being written of in an RTC, replaced by Dennis F127/SS263 F25 OCR in 1989. Added by Jon Godden on 05 June 2018. I remember vividly seeing one of these yellow booms extended up the side of The Grand Hotel in Brighton following the 1984 IRA bomb that nearly murdered the UK government of the time. I wondered why they were yellow, and 34 years later I get the answer! Added by on 06 June 2018. 67% write-off rate say something about how drivers were trained back then! Or was this typical - sounds pretty horrific if it was. Did the yellow paint actually help the third one to survive, or contribute to the other two getting wrecked, I wonder? Just realised my above comment is slightly wrong - Worthings FPO 135H was still full Yellow when written of in fatal 1977 RTC on the A24 .. LBP 773J (Chichester, Bognor & Worthing) was written off whilst being towed in Cheshire after going to ERF for some brake repairs so was not being driven by a Fire Brigade employee at the time..(the booms hit a motorway bridge). Worthings MPX 842J and RT MBP 550J attended the Grand Hotel bombing. Rob, all 3 West Sussex ERFs were single cab. Added by Jon Godden on 07 June 2018. You can cut the percentage to 33%, LBP 773J was written off following collision with a bridge on M1 near Milton Keynes, whilst on suspended tow, after mechanical failure on return from Simon, Dudley, so not down to brigade driver. Added by M.west on 08 June 2018. But I must add that even one out of three is pretty alarming. Added by Rob Johnson on 15 June 2018.